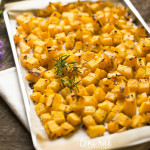 Sophie is one of my favorite bloggers in the paleo autoimmune community. 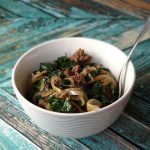 She has a beautiful blog called A Squirrel in the Kitchen, which combines gorgeous food photography with delicious, approachable recipes, as well as straightforward advice for living a healthy autoimmune life. She herself used the paleo autoimmune protocol (AIP) to put her Hashimotos into remission. 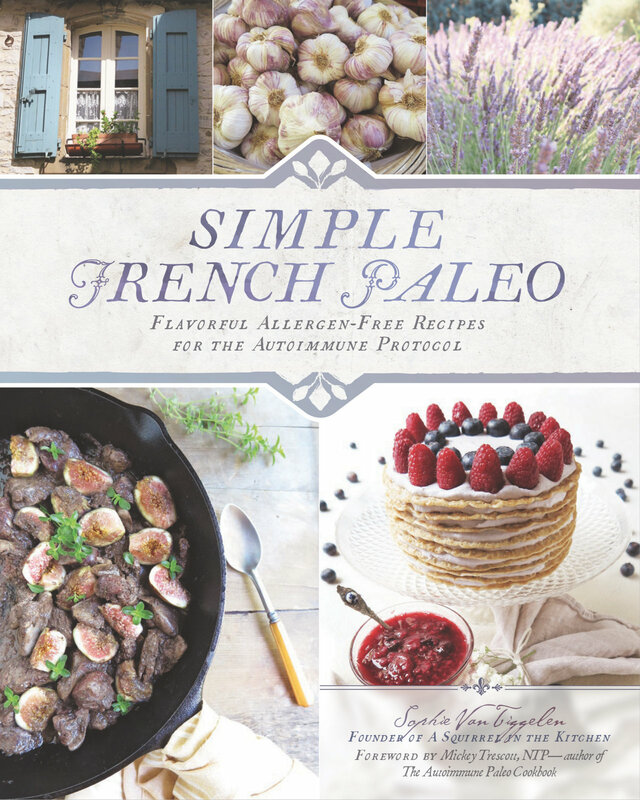 With this cookbook, she combines her French Belgian upbringing with her knowledge of the AIP to bring a whole new flavor profile to our kitchens. I love how the cookbooks for our community are expanding. Each new offering is completely unlike the ones that came before. You mention that this cookbook was inspired by the food you grew up eating in Belgium. Describe a typical meal from your childhood and what you had to change to make it AIP. My grandmother on my father’s side had a farm back in Belgium where she raised animals (lamb, chicken, rabbits) and grew her own vegetables. I remember being a little girl and eating fresh lamb liver, seared in a large cast iron pan with a huge blob of butter, salt, and pepper! I was inspired by this memory when I created the Chicken Livers with Fresh Figs recipe (Simple French Paleo, page 156). To make it AIP compliant, I replaced butter with olive oil, and took the pepper out. I also added some of my favorite herbs to give it a flavor boost, as well as fresh figs to counterbalance the earthiness of the liver with the delicate sweetness of the fruit. As you can see, eating AIP is not bland or boring! There are many herbs and spices at your disposal to complement and bring out the natural goodness of real, simple food. Plus, you get extra bonus points for nutrient-density with this recipe! You took a trip to Provence, France when you were writing this cookbook, and people always love to hear travel tips for the AIP. Was it easy to eat AIP in Provence? What steps did you take to stay on your healing diet? Our entire extended family got together in the south of France (we were over 30 altogether) and in order to house everyone, we rented a big “mas” (traditional farmhouse) in the countryside. I had my own little kitchen and fridge where I was able to keep my food separated from the others to avoid contamination. Since I was busy during the day and didn’t want to spend a lot of time cooking, I purchased a slow cooker on amazon.fr and had it delivered. I used it to prepare my evening meals while I was roaming the countryside, enjoying myself and taking pictures! As a bonus, I ate the leftovers for breakfast. For picnics during the day, I had brought with me from the US a big load of coconut wraps to prepare “sandwiches”. I would load them with cold meats, lettuce, and avocado. I wrapped these in aluminum foil and packed them in a small cooler that I had also purchased in Europe. I never lacked fresh fruit and vegetables during my vacation. 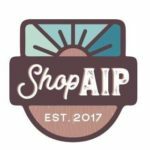 You can find all you need to stay AIP in local grocery stores or at local farmers markets. I had made a search on Google ahead of time and I knew exactly where and when to go to find these farmers markets. While we were in France, we went out to eat at a restaurant one time. I ordered a beef kabob (brochette de boeuf) with cooked vegetables and a salad on the side. I asked the server for olive oil and vinegar for the dressing. My plate arrived with tomatoes but I simply pushed them on the side and ate the rest ravenously! What I love about your cookbook is that the recipes are unique and flavorful enough to bring something new to the kitchen of expert cooks, while also being simple enough that beginners can make them, too. When you first started AIP, were you already an expert cook or was there a learning curve? 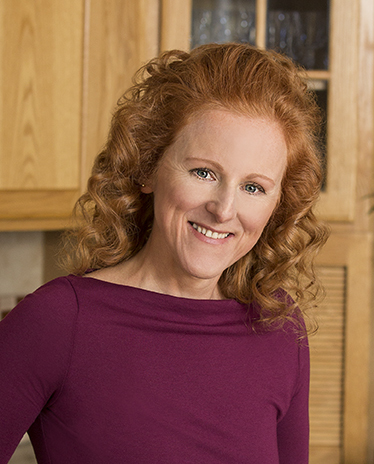 When I started AIP, I knew my way around the kitchen but I was no Julia Child! In fact, at the beginning of my healing journey, I was simply too exhausted to spend much time in the kitchen. I needed to keep things quick and simple, and at the same time I had to feed my husband and children. So I turned to the traditional French cooking of my youth and I rediscovered how simple and honest food could be. Even as I was struggling with an autoimmune condition, I could still enjoy the pleasures life had to offer! I began developing tasty AIP-based meals that were nutritious and satisfying enough even for those not suffering from an autoimmune disease. You cook these meals for your entire family. What's your favorite recipe? What's your husband's favorite recipe? And what recipes do your daughters love? What is my favorite recipe? That is a really hard question to answer because every single recipe in Simple French Paleo is deeply rooted in tradition and they bring up a lot of memories. You see food is not just fuel for me, it is also an emotional experience! For example, when I savor a simple artichoke with a shallot vinaigrette (page 64), I am immediately transported to my mother’s kitchen a long time ago. I see myself as a little girl, eagerly eating the petals, the succulent vinaigrette dripping on my chin! Each time I prepare a lamb roast (page 152), I think lovingly of my grandmother who was raising lambs on her farm. And the French crèpes, of course, were a staple growing up not only for special occasions (we would have “crèpe parties” with a gazillion different toppings), but also as an after-school snack. My husband’s favorites include the French onion soup, brandade express, bouillabaisse-inspired seafood stew, and chocolate mousse. My daughter’s favorites include the slow cooker chicken soup with avocado and scallions, colorful, fruity fennel salad, gingerade, vanilla ice cream and chunky black olive tapenade with oregano crackers. You have a very thorough introduction to your book, which I love. It covers your personal story, details about the autoimmune protocol, and also the importance of aspects of healing beyond food. What's one area that people often forget to focus on when it comes to healing, that you think is essential? I know from personal experience that managing my stress is as important as the food I am eating (or not eating). When I was first diagnosed with Hashimoto’s disease in 2009, I was suffering greatly from anxiety, panic attacks, and severe insomnia. These symptoms were debilitating and I couldn’t function as a “normal” person. So, anxiety and stress reduction were, and still are, a top priority for me. With practice, I have developed an awareness of my stress level and as soon as it goes into the red, I switch into zen mode! I will stop everything I am doing and focus on my self-care. From the outside, this might look like I am a slacker, or lazy. But in fact I am listening to my body, making myself a priority. I see it as an investment in the future, my own health insurance. So, not only is it important to recognize the first signs of anxiety and stress, but it is also important to be willing to do something about it. It contains 90 recipes, including appetizers, soups, salads, vegetables, meats, seafood, desserts, drinks and condiments. Check out these mouthwatering examples: Avocado Mayonnaise, Bouillabaisse Seafood Stew, Chicken Blanquette, Vibrant Pork Belly Salad, Herbed Roast Lamb, Garlic and Herb Stuffed Mushrooms, Nicoise Salad, Chocolate Mousse, and Layered Raspberry Crepe Cake. And those are just a few! Every recipe is 100% AIP. 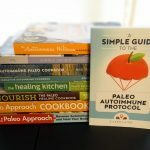 The author knows the paleo autoimmune protocol inside and out, having used it to help put her Hashimoto's into remission. The cookbook introduction provides a concise overview of the AIP, including tips for choosing the most nutritious food, as well as advice for making good choices when it comes to sleep, stress and self-care. I especially like her AIP Pantry chapter, letting you know which shelf-stable ingredients come in handy in an AIP kitchen. 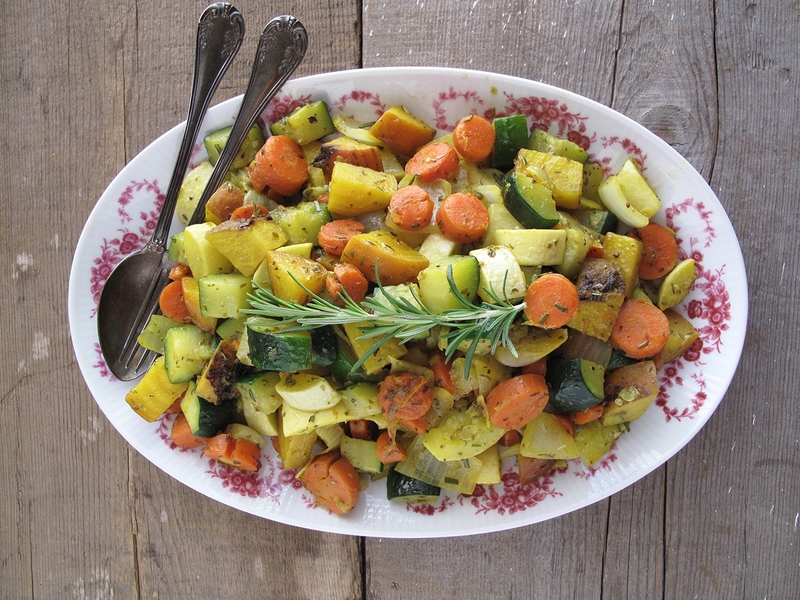 The recipes are based in the Provencal tradition of simple, honest, seasonal, flavorful food. Whether you are a new cook, a busy cook, or an experienced foodie, these recipes will appeal. If you eat with your eyes, you are going to love this cookbook. Not only is the food photography amazing, but the travel photos of Provence will make you want to travel to France yourself. It's available in Paperback through Amazon, or as a PDF ebook. In a large saucepan, heat olive oil over medium–low heat. Add beets, carrots, and garlic. Cover and cook for 20 minutes, stirring occasionally. Add onion, yellow squash, zucchini, oregano, rosemary, and sea salt. Continue cooking, covered, until vegetables are tender, about 20 minutes. Check seasoning and adjust salt to taste. Serve hot or cold. Note: Add 10–15 minutes to the cooking time if you prefer your ratatouille well-done over crisp-tender. The winner was chosen with a random number generator on 6/18/2016. Congratulations to Jennifer Cvelic! If you didn't win, don't despair. The book is for sale through Amazon.com. It's become a tradition on my blog to host giveaways of my favorite books, and Sophie has agreed to donate a PDF e-book copy to the winner. Entering to win is easy. Just comment on this post that you want to win. That's it! If you want to follow me on Facebook, Instagram, iTunes, Pinterest, and/or Email, you'll get all of my tips for autoimmune healing. But it's not required at all. Since I love all my readers around the globe, this giveaway is open to anyone in the world. Good luck! The winner will be randomly chosen on June 18, 2016. And if you don't want to wait, you can buy a copy now: Paperback or PDF.